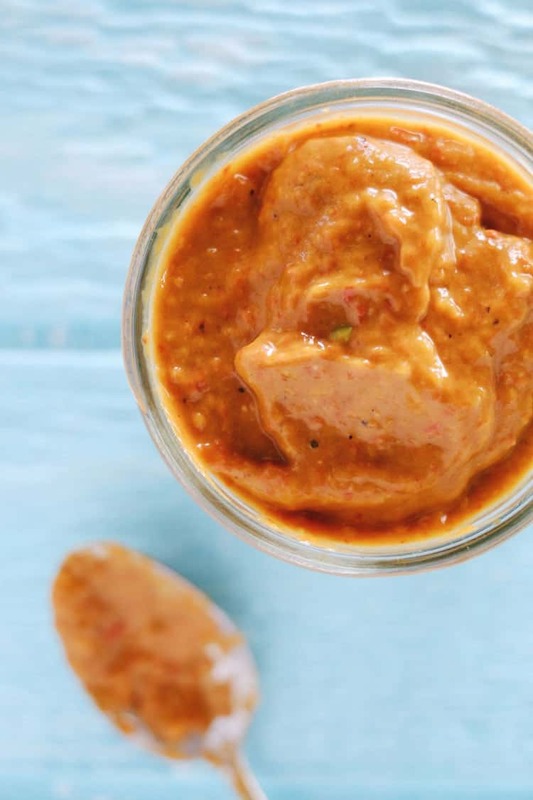 I didn’t even know I had a total thing for sauces until Justin created this 5 minute roasted pepper sauce, and now all I want to do is put it on everything! Everything. All the time. We use it as a dip, as a sauce, spread, and you can even thin it out with water or oil to create a dressing or marinade. It is so good and so easy! You know those are my favorite things! 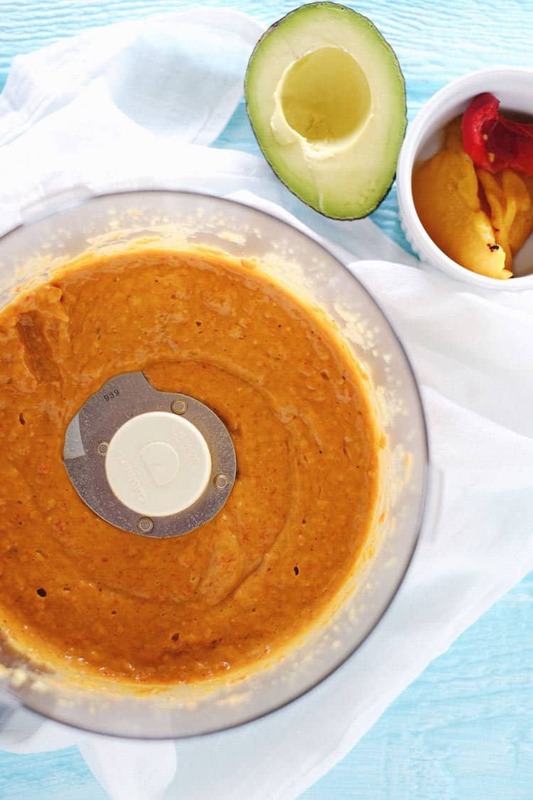 This roasted pepper sauce is a breeze to make. In fact, you can see just how easy it is to make in the video below. We partnered with Greatist to make this video, be sure to check out thier site for tons of awesome content! You see? You will be slathering this sauce on all of your favorites in about five minutes. Use it up right away or store it in an airtight container in the fridge for up to a week. Ours has yet to last that long! The flavors of this roasted pepper sauce are incredible. The roasted peppers give it a bit of a smoky taste while the avocado adds a creaminess you wouldn’t believe. This is about to be your new favorite sauce! You will find so many ways to enjoy this sauce! Put it on your eggs in the morning, use it as a dressing for your salad at lunch, dip veggies in it for a snack, and then douse your chicken, beef, or fish with it at dinner. Seriously, the options are endless! The jar of roasted peppers we use has both red and yellow peppers, so our sauce has an orange hue. If you used all red peppers you’d get a brighter red sauce. We found a clean jar of roasted peppers at Trader Joe’s (TJ’s) with no added sugar or other weird ingredients. The little glass jar is TJ’s brand fire roasted yellow & red peppers. If you don’t have a TJ’s near you, look at your local Whole Foods or other health food store for something with simple ingredients and no added sugar. Ok, it is time! 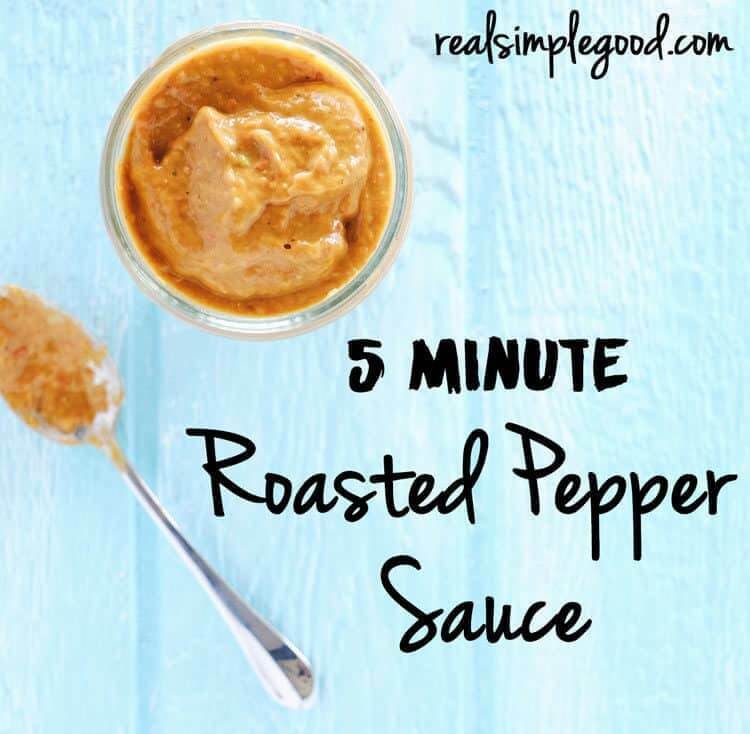 Go make a batch of this 5 minute roasted pepper sauce, and let us know all about the creative uses you come up with by leaving a comment below. Take a photo, and tag us on Instagram @realsimplegood, so we can check it out! Scoop out the avocado meat and place all of the ingredients in a food processor and blend until smooth. Use immediately or place in refrigerator for up to one week. Put it on everything. 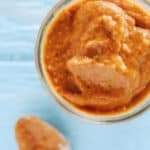 Serve as a dip, spread, or sauce -- or add additional water or oil to thin the sauce for use as a dressing or a marinade. Wait, this sauce has avocado in it?? Yum! I just picked up a jar of those peppers yesterday at TJ’s- they are so good! This sauce looks amazing and homemade is always the best. YES!!! The avocado adds a creaminess that is just so perfect! Sounds like we posted this one at the perfect time for you! You’ve got the peppers already, and I bet you have avocados and garlic on hand! 😉 Hooray! Let us know if you give it a try! This is definitely YUMMY! I make it almost exactly the same ~ I roast my own peppers on the grill and leave in a covered bowl to cool and then remove the skins. You’re right.. the colour varies with the peppers used, of course.. and YES the 5 minute sauce is longer ..more like an hour, with the grilling! Same amazing taste though.. It’s a perfect match. Avocado + Peppers + Garlic! and yes… we put that ………..on everything !! I want this like now! Thank you for the great recipe – going on my menu plan!